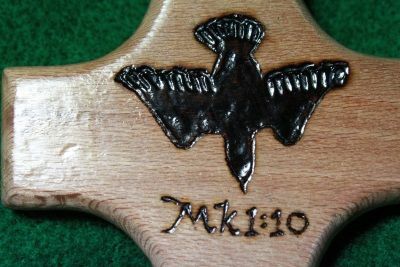 I’ve really gotten into wood burning in expressing my faith. While I do a number of still simply burning projects, I get joy out of cutting, shaping a wood pocket “comfort” cross and prepping it for burning. I do trace the image, for now, onto the woos and then burn it in. The letters and numbers are freehand. I am aided with the use of a table mounted, lighted magnifying glass. I make then for sale and donations and will usually ask for a person’s name and favorite scripture verse. 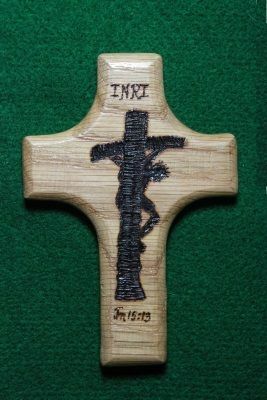 I also make slightly smaller crosses for women and children as shown in the picture with the name Rosie on it. Thanks for expressing your faith in such an awesome way. The detail on Christ’s face is really good. The one that really speaks to me is Christ on the cross. ‘It is finished’. Our salvation was assured in that moment of ultimate sacrifice. All of my sins were washed clean in that moment. They were heaped on Christ in that awful yet supremely important moment. So again – thank you!